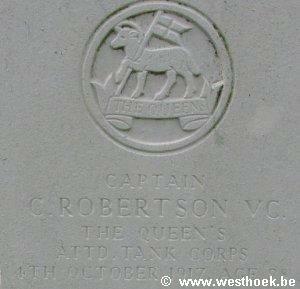 ROBERTSON, Captain, CLEMENT, V C, 3rd Bn. The Queen's (Royal West Surrey Regt.) attd. Tank Corps. 4th October 1917. Age 28. 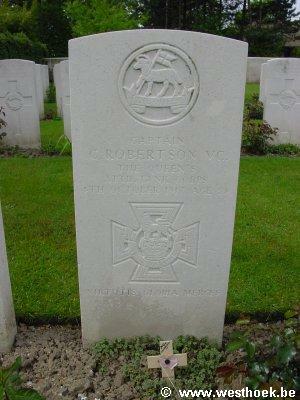 ROBERTSON, Captain, CLEMENT, V C, 3rd Bn. The Queen's (Royal West Surrey Regt.) attd. Tank Corps. 4th October 1917. Age 28. Son of Maj. John Albert Robertson (late R.A.), and Mrs. Frances Octavia Caroline Robertson (nee Wynne), of Struan Hill, Delgany, Co. Wicklow. Oxford Road Cemetery "Believed to be buried in III. F. 7." An extract from "The London Gazette," No. 30433, dated 14th Dec. 1917, records the following:-"For most conspicuous bravery in leading his Tanks in attack under heavy shell, machine-gun and rifle fire. Capt. Robertson, knowing the risk of the Tanks missing the way, continued to lead them on foot, guiding them carefully and patiently towards their objective although he must have known that his action would almost inevitably cost him his life. This gallant officer was killed after his objective had been reached, but his skilful leading had already ensured successful action. His utter disregard of danger and devotion to duty afford an example of outstanding valour."